the Coe Branch look easy. Mt. Hood, pink in the evening sky. 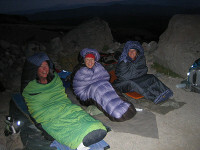 and Mary Campbell (L-R) cocooned for a cold night on Cooper Spur. Mt. Hood has always called to me. Its steep ridged slopes, the glaciers clinging to its upper reaches, and the steam clouds that appear in the clear blue sky at its summit give the impression of a living being, overseeing our meager human endeavors. The 41 mile Timberline Trail that takes hikers around the mountain has always been a dream for me. But, as years have passed, the dream of making this strenuous hike seemed farther and farther out of reach. So, when friends, Alsie Campbell and Janet Throop, suggested we add it to our summer plans, I was speechless. Joined by Alsie’s daughter-in-law, Mary Campbell, we began to set those plans in motion. 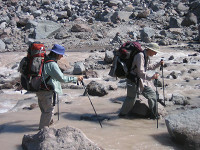 All of us are fit, experienced hikers and backpackers who are eager to continue hiking into our “sunset” years. Yet, I know hikers 20 years younger who started out and quit, saying it was more difficult than they had planned. Here we were, with a combined age of 235+ years, setting out on an adventure that others have failed to complete. The date was set for early September to avoid mosquitos and overly treacherous river crossings. We hoped for good weather and set out from Timberline Lodge with warm sunshine, heading west. Alsie, a distance hiker, wanted to complete the trek in three days. We made six miles the first day, most of it downhill from our 6000’ starting point. Our first river crossing, the Zig Zag River was time consuming. We were determined to keep our boots dry, it took an hour to find the best spot and make it to the other side. We congratulated ourselves and moved on. We set up our first night’s camp at Paradise Park. We had level ground, easy access to water, and a glorious view of Mt. Hood bathed in the alpenglow of sunset. We climbed into sleeping bags to the lilting sound of Janet’s recorder, haunting and beautiful. The next morning, we continued down into the Sandy River drainage. The low point of the trip was 3000’, crossing the Sandy River on a log. Alsie decided to avoid the hazards of the log and just waded across. One by one, we balanced our way across and again congratulated ourselves on our accomplishment. Our reward was the exquisite Ramona Falls. We ate our lunches and the beauty of the mountain fed our souls. The falls are a sight not to be missed. I used our lunch break to also wash socks and to soak my badly blistered feet. The grit from the trail was filtering in through the mesh on my boots. Every step was like walking on sandpaper. All my efforts went to walking normally so my body would not succumb to the pain in my feet. Wracking up another six miles and the Muddy Fork river crossings, we cooked dinner on the trail and set up our second camp at Bald Mountain. I only wanted to get my shelter up and go to bed, but I was “told” to put down my pack and keep walking. A quarter of a mile walk without a pack was luxury and the payoff was another view of Mt Hood, pink in the fading light of sunset. Camp set up done, we headed up the trail again, and in the dark found Mt. Hood detailed by the light of a three-quarter moon. The third day on the trail is usually when things begin to get easier. The pack becomes part of your body, muscles no longer whine, and everything falls into the rhythm of walking. We were rounding the northern slopes of Mt. Hood. So far, we had hiked through conifer forests, rocky slopes, high meadows, and sweeping views. We were not expecting wild flowers, but found hillsides full of blooming as well as spent flower heads. Monkey flower, Indian paintbrush, lupine, fireweed, dish mops, and bear grass, to name a few, were everywhere. We even found one patch of grass of Parnassus, a delicate white flower I had never seen before. Lunch was at Cairn Basin and we began to worry about a late afternoon crossing of the Coe Branch. Afternoon warmth makes the river crossings deeper and more treacherous. After a cold night, river levels are at their lowest and safest. It was decided that six miles would again be enough and we would camp at Elk Cove. We found a beautiful meadow, a trickling stream, and a level camp in the trees. We decided we were home for the night. We sloshed our clothes in the stream to rid them of trail grit and soaked our feet. It was as good accommodations as you could find anywhere on the planet. The morning found the Coe Branch high and fast with no dry passage. Following Alsie’s lead, we waded, boots and all. With packs unbuckled for safety and facing up stream, we used our trekking poles for balance and easily made it to the other side. The Eliot River crossing was wider and faster and bone chillingly cold. We had a lunch break to warm our feet and set our sights on another five miles to add to the five we had made that morning. We were hoping to get across barren Cooper Spur before camping. We stoked up on water and headed up. With all the years we were hauling along with our packs, we were slow. At a group “meeting” the question finally came up. Do we go back down to camp or go on? We had covered a lot of “up” miles that I did not wish to climb again so suggested we move on. We located a shelter on the map in the middle of Cooper Spur and decided to check it out. It turned out to be our best camp. High on a rocky slope, we had views north of Mt. Adams, Mt. St. Helens, and Mt. Rainier. In addition, we could look out over eastern Oregon for miles. Mary brought out a kite and the wind carried it high into the sky. The sun went down casting a shadow of Mt. Hood over the smoke from wildfires and a full moon came up inviting us to sleep outside under the stars. We awoke to a stunning sunrise and “our” mountain bathed again in morning alpenglow. 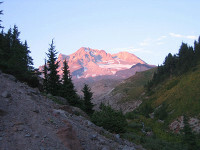 At 7300’, Cooper Spur is the high point on the Timberline Trail. Mt. Hood, at 11,249’, is within touching distance. Each turn of the trail brings a new profile of the mountain that we were getting to know. My camera filled up with scenes of beauty and drama, detailing the seasons and geology of Oregon’s highest mountain. We ate lunch on Gnarl Ridge looking up at the Eliot and Newton Glaciers and down to the Newton River we would be crossing before our last camp in Heather Canyon. Our final obstacle, the White River, turned out to be our hardest. The river cuts through volcanic and river churned rocks. Upper slopes covered in forests become barren deserts in the canyons. Following rock cairns we found what looked like a possible crossing. The river was at the bottom of steep, 12’ cut banks of loose rubble. One at a time we inched down, crossed the river, then climbed out. Once all of us were through, we found that the river had two channels and we had to do it again. I look at the photos and cannot imagine that it was possible. We did not fill our water bottles at the White River. We were confident that we would come to a stream in the forest between us and Timberline Lodge. We were wrong. A family overheard our lament. Not carrying packs, they easily outdistanced us and about a mile from Timberline Lodge, the father and daughter returned to give each of us a bottle of cold, delicious water. They were the Trail Angels, found wherever hikers hike. They are nameless and blessed. Coming out above Timberline Lodge, our hike over, we paused to reflect. Dirty, hungry for something other than freeze dried, and exhilarated, we hated to see it end. One of us remarked that we had eaten huckleberries everyday of the hike. We marveled at this simple observation. It was the hike of a lifetime. And, we made it!